A worker holds uranium pellets, a nuclear fuel produced for atomic power plants, at Ulba Metallurgical Plant in Kazakhstan`s eastern town of Ust-Kamenogorsk in this August 11, 2006 file photo. It once produced material for bombs capable of blowing up the world. Today, Ulba Metallurgical Plant, known by the codename A2 during the Cold War, is focused on what it calls "the peaceful atom": nuclear fuel for power plants. Hidden in the wilderness of eastern Kazakhstan, it was set up in 1949 as part of Josef Stalin's race for nuclear supremacy with the US. Its current bosses also want to be No. 1 in their field. "We are now driven only by business opportunities," said Alexander Gagarin, deputy head of the state-controlled plant. "We hope that by 2012 we'll be the world's number one player on the nuclear fuel market. We are hoping to secure at least a 30 per cent market share." Ulba's plans mirror Kazakhstan's wider ambitions. Home to a fifth of global uranium reserves, the Central Asian state wants to be the world's No.1 uranium producer by 2010, surpassing Australia and Canada. It also wants to develop a broader nuclear industry. And here Ulba, once a key supplier of enriched uranium for Soviet nuclear warheads and atomic submarines, plays a central role. Today, one in every 20 nuclear plants around the world uses atomic fuel produced by Ulba, named after a local river. But a sense of secrecy lingers. Men in camouflage fatigues carrying AK-47 rifles guard the gate to the industrial maze of roads, warehouses and little parks. Visitors are given badges to measure exposure to radiation, and mobile phones are not allowed. Ulba does not publish production details. It sold 2,928 tonnes of uranium products in 2005, according to the Kazakhstan Stock Exchange. Comparative data was not available. Ulba, which employs 5,000 people and also produces minor metals beryllium and tantalum, is still working at the low-end of its Soviet-era capacity. 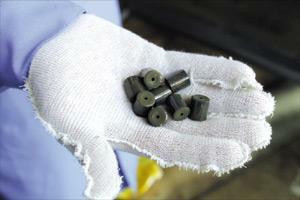 Officials hope uranium fuel production will go up to 90 per cent of capacity by 2012. To make this possible, Kazakhstan plans to triple annual uranium production to 17,500 tonnes by 2015. Kazakhstan's long-term plans go beyond making raw materials. "We want to have a full nuclear cycle. We want to be self-sufficient," said Anatoly Kuchkovsky, head of Ulba's uranium production line. "It's not easy. We are working on it. We are working on new products and technology. But it will take more than five years." Ulba produces uranium pellets that need to be processed further - mainly in Russia - into end-products used to power reactors. By securing a full cycle - from mining uranium to making end-products - Kazakhstan hopes to bypass Russia and work directly with export markets in Europe and Asia. Uranium exploration in Kazakhstan started in 1948, a year before Moscow tested its first atom bomb in the country's north. Some Kazakhs argue that the country, with its vast oil and gas reserves in the Caspian Sea, does not need nuclear technology. The industry's image still suffers from Soviet era atomic weapons tests in the thinly populated country, where thousands of people still suffer from the effects. But the government wants to cash in on nuclear power, back in vogue with Western and Asian states seeking new energy sources to shield themselves from oil price hikes. Inside the Ulba plant, in a corner dedicated to its history, a black-and-white picture of Stalin hangs not far from a more recent image of Kazakh President Nursultan Nazarbayev. Svetlana Mordvinova, an austere 66-year-old dressed in black, looks at the pictures and says she is glad she has worked at Ulba for more than 40 years. Like many other scientists, she moved here from Russia but would not elaborate on her family history. "This place was full of secrets. It still is. In 1964, for example, they tested a nuclear-powered airplane. We knew nothing about it," she said. "They only told us about it in 2003." Today, Kazakhstan says its activities are totally transparent. The West, at odds with Iran and North Korea over their nuclear ambitions, is concerned about the growing number of states hoping to create full-cycle nuclear industries. Kazakh officials never tire of telling visiting foreigners that their country voluntarily handed the Soviet nuclear arsenal that it inherited in 1991 back to Russia. The International Atomic Energy Agency monitors Kazakhstan's activities and IAEA inspectors visit Ulba at least once a year. "What we do here is business," said Mr Kuchkovsky. "The rest is just politics."